n Holiday cruise with my mom for 15 days during Christmas and for New Year’s Eve. While I knew of Crystal Cruises’ reputation for luxury and world-class service, nothing could prepare me for what I was about to experience onboard Crystal Symphony. Immediately upon boarding the ship in San Juan, Puerto Rico, we were greeted with champagne and warm smiles. Since this was my first ever cruise (and my mom’s first ever trip abroad), the magnitude of grandeur was astounding. My mom and I both stared in awe as we toured the ship. Over the course of the last 10 or so days, I’ve gotten so close with both the crew and guests that it now feels like family. And, while at first the number of things to see and do onboard was overwhelming, it now feels like home. 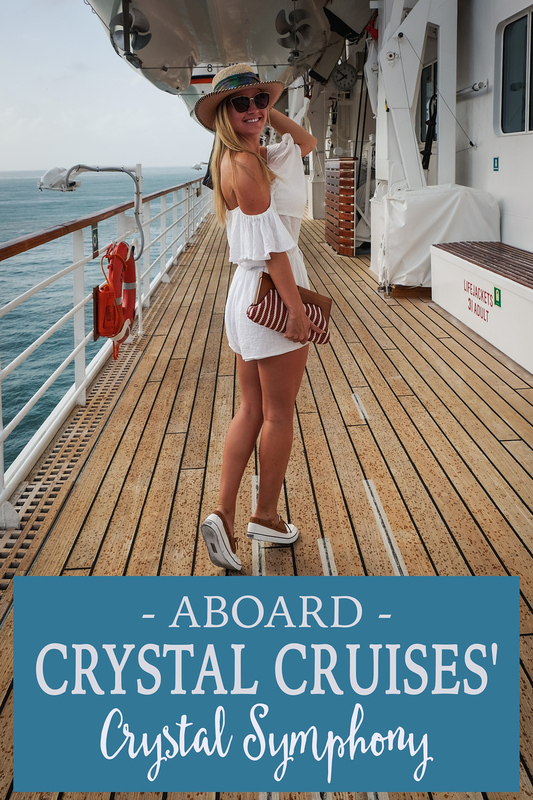 Here are a few highlights for anyone going on their first Crystal Cruise! My mom and I stayed in a penthouse on the cruise and I have to admit it was amazing. The room is incredibly spacious, with a couch and large veranda. And the bathroom is well appointed with full size Etro toiletries from Milan and even has a large bathtub. I still have no idea how they managed, but every last inch of ship was beautifully decorated for the holidays. Christmas trees, garland, twinkling lights, and even a life-size nativity were on display. 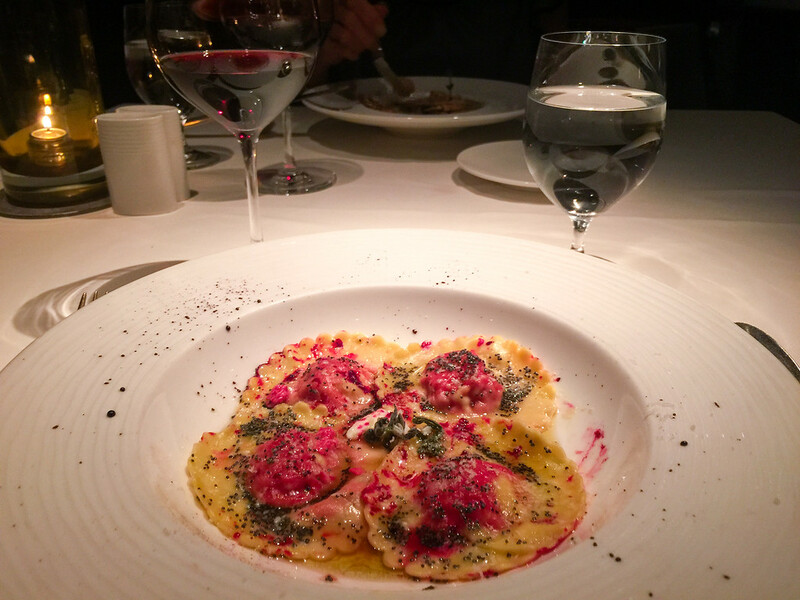 You can read more about celebrating Christmas at Sea on Crystal Symphony on Crystal Cruises’ blog where I share the one of a kind holiday experience onboard. It was truly magical. Aside from the holiday decor, the ship has everything you could ever need. Craving a spicy margarita and hot french fries by the pool? No problem. Feeling like a good workout and steam before starting your day? Head to the fitness center. There’s a library, beautiful boutiques, a casino, salon, pool & jacuzzi, and so much more. The biggest highlight for me has been the incredible dining experience onboard. Crystal Symphony has two specialty restaurants- Prego and Silk Road and The Sushi Bar. Prego features delicious Italian fare, while Nobu Matsuhisa’s Silk Road features Japanese food with a bit of Peruvian and European fusion. Since Crystal Cruises is all inclusive, everything on board is just that – included. 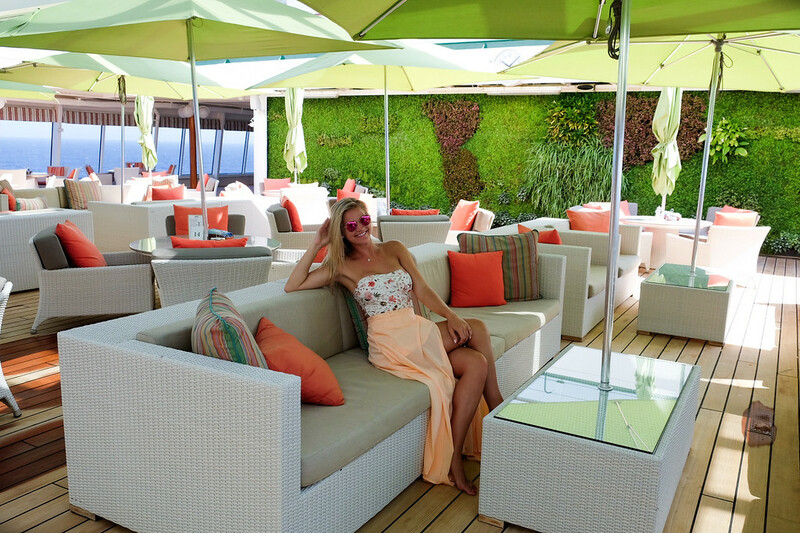 Each morning I would start my day at The Bistro with an iced soy latte and enjoy the breakfast buffet on the Lido Deck. The buffet is unlike anything I have ever experienced. Every item is gourmet and fresh. Whether you want cheese, eggs, baked goods, or a smoothie, they have it. Most days I’ve spent a few hours out by the pool with some of my favorite crew members. Every staff member remembers your name and your favorite drinks and snacks. Without asking, I would have a sparkling water with lime brought to me and asked if I’d like my usual drink order of a margarita. Each afternoon, you can enjoy tea in the Palm Court where a jazz band plays music and you can nibble on scones and watch the ocean from nearly 360 degrees around you. Aside from the specialty restaurants, I enjoyed most of my dinners in the Crystal Dining Room. I have no idea how it’s possible, but the menu changes every single night. The chef prepares incredible food and the pastry chef always has new and delicious desserts to choose from. For example, last night I had a caviar starter and huge king crab legs for dinner. For dessert, crème brûlée. The night before, I had grouper served on a bed of beetroot risotto. And the list goes on and on. Each meal is always incredible. And lastly, if you are feeling like a morning or evening in, there’s 24 hour room service. The entertainment on board is also world class. Whether you want to take a dance lesson or play a board game out by the pool, Crystal Symphony has something for everyone. Each night, there are incredible performances as well as nightly shows with magicians, mentalists, singers and dancers. We’ve also had some really fun nights singing karaoke in the Avenue Saloon! Above all, what truly sets Crystal Cruises apart from the rest is the incredible onboard experience and friendly service. Nearly every guest I’ve met on board has been on three or more cruises with Crystal Cruises. And most of them say it’s because of the incredible hospitality. Every waiter, bartender, dancer and even the maids have all been warm and incredibly friendly. Most crew have been working on board for many years and it’s a true testament to the overall experience that Crystal Cruises provides guests as well as their staff. If you’re looking for the ultimate luxury cruise experience, I can confidently say there’s nothing that compares to Crystal Cruises. If you have any questions about my experience onboard, please comment below and I’ll be sure to answer! Special thanks to Crystal Cruises for hosting me and my mom as their guest. As always, the content & opinions expressed here are entirely my own. 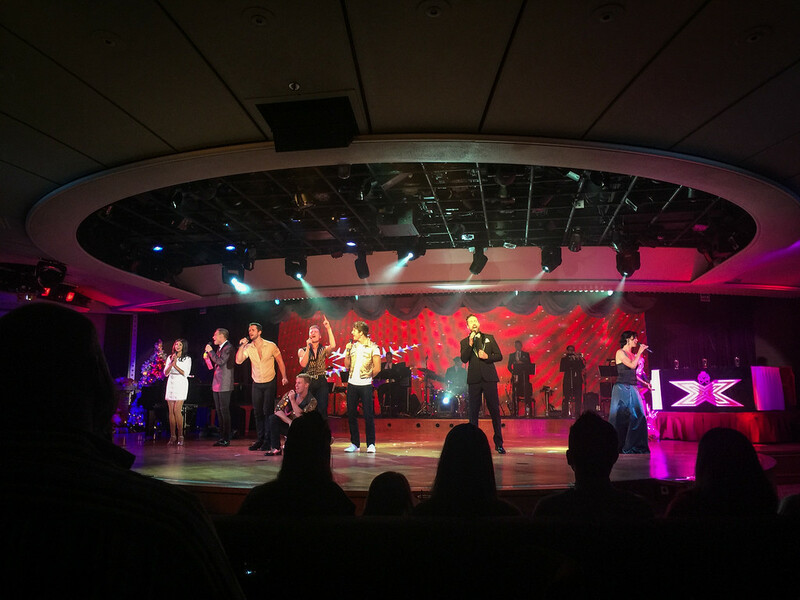 Your cruise looked like so much fun! Question for you, did you use the tep wireless while you were on this cruise, if so, did it work well? Now it is time for a cruise on Crystal Serenity… all the same great food and service with one more dining option… Tastes. Crystal is amazing. Sounds like a great trip!